Scotland beat Oman by 15 runs to win the three-match one day series 2-1. After being put into bat, George Munsey's 96 helped the Scots amass 303-5, with Richie Berrington 72 not out and Calum MacLeod contributing 64. Sandeep Goud top-scored for Oman with 49 before being caught by Matt Cross as the hosts finished with 288-8 from their 50 overs. Berrington took 2-44 and Safyaan Sharif 3-65 to ensure interim head coach Toby Bailey won his last match in charge. Shane Burger takes over as Scotland's new head coach next month and his first games will be against Afghanistan and Sri Lanka in May. 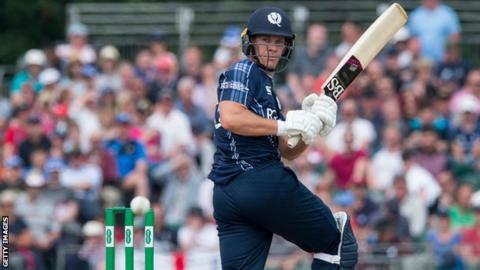 Friday's win also completed Scotland's first tour of Oman, having beaten them en route to winning the T20 quadrangular series involving Ireland and Netherlands. Oman, who lost by 10 wickets on Monday, had beaten Bailey's side by 93 runs on Wednesday.